The Democratic mayor, who is considering a 2020 White House run, called the pact a national model that shows how deeply divided factions can find common ground. The teachers union in the nation’s second-largest school district ended a walkout Tuesday after winning higher wages and cuts in class sizes. The strike that began Jan. 14 threatened the mayor’s argument that local government is where progress is made in America, while highlighting the risks of launching a presidential campaign from City Hall. No sitting mayor has ever been elected to the White House. Garcetti suspended consideration of a 2020 candidacy with teachers on the picket lines, but indicated Wednesday a decision was not far off. “Stay tuned,” he said. Political scientist Jack Pitney said the end of the walkout will free up time Garcetti needs to make a 2020 decision, though it’s unlikely to add much luster to his resume. Outside of Southern California “not many people are paying attention,” said Pitney, who teaches at Claremont McKenna College. With the Democratic field growing larger each day, the mayor faces increasing pressure to make a decision because he could fall behind in crucial fundraising. Even on his home turf he would be competing for those dollars with another Californian, Democratic Sen. Kamala Harris, who entered the race on Monday. If he gets into the race “he needs to establish his unique selling proposition, what sets him apart from the other candidates,” Pitney said. 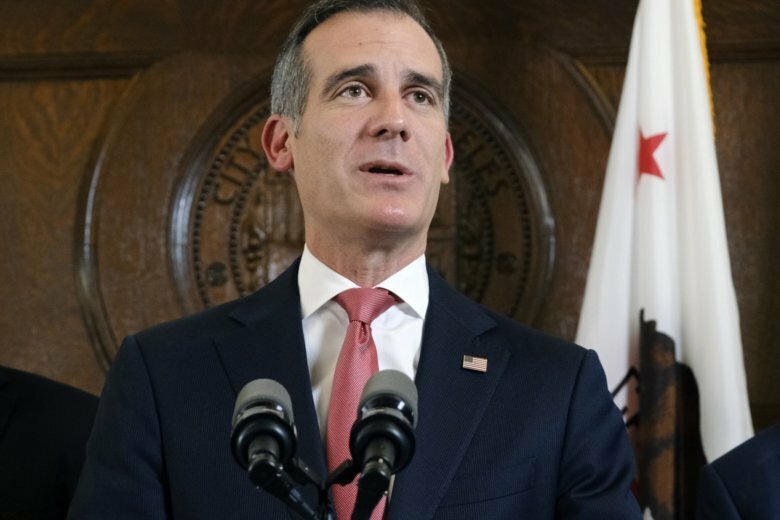 The mayor has no direct authority in the Los Angeles Unified School District, but Garcetti said he was compelled to get involved because success of the schools is directly linked to the success of the city. His role that began quietly months ago evolved into mediator, note-taker, shuttle diplomat, arm-twister — even therapist, he quipped — between the union and the school administration. He described a bargaining environment that for months was devoid of trust, with each side unwilling to listen to the other. Even when a deal was close early Tuesday morning, both sides nearly walked out over a long-running dispute over a provision that allows the district to unilaterally increase class size during times of financial strain. With negotiators from both sides packing up at City Hall, Garcetti said he began urging district Superintendent Austin Beutner and union President Alex Caputo-Pearl to give it another chance. The three talked and the disputed language was eventually withdrawn. “We had a deal,” the mayor said.